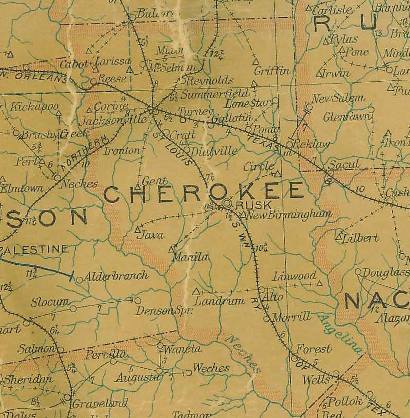 There was settlement in the region prior to the Civil War, but a community per se didn't materialize until around 1900 when the Texas and New Orleans Railroad built through Cherokee County. The community was granted a post office in 1903, named after J. A. Turney, early resident. Turney had two stores and a population of seventy-five by 1914. It increased somewhat in the prosperous 20s, and remained around 100 during the Great Depression. After WWII all of Turney's businesses closed and the 1990 population remained around 100. Texas Escapes, in its purpose to preserve historic, endangered and vanishing Texas, asks that anyone wishing to share their local history and vintage/historic/contemporary photos of their town/subject, please contact us.